Unlike the original blog, I have delayed putting this page up until all material is posted. This permits reading the articles in first to last sequence, unlike the usual blog format which goes from the most recent backwards. Because there is so much material, I am going to break it down by year. This page is when the war ended in 1865. At last the final year of the war arrives! Unlike previous years, there is no mention of the holidays of Christmas or New Year which ordinarily appeared later in January of the following year. 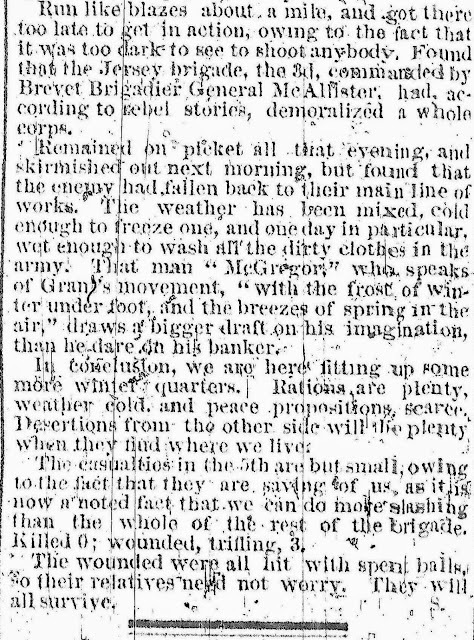 After a silence for the start of 1865, word finally appears about the Fifth Infantry! Furloughs, food, health, and good quarters in the midst of skirmishes bring hope to the Army of the Potomac. At the same time negotiations have been unsuccessful. Jefferson Davis requested an armistice by the end of January. He hoped, once fighting stopped, the North would not resume, but instead would recognize the Confederacy as a separate country. While he wanted to buy time, Lincoln wanted to show nothing would end until the country reunified and slavery ended. Neither side was willing to compromise, although Lincoln offered to pay slave owners for their freed slaves, and so the war continued. This Valentine comes from the Free Press who opposed Lincoln and the Civil War, but knew the Michigan Fifth Infantry had home support regardless of political opinion. Boredom on the front lines is relieved by orders to march in an effort to flank the Confederates. Like the Advertiser and Tribune article published a week earlier, morale is excellent among the Fifth even as they leave better quarters. Of course the Free Press points to the darkest concerns to match their own viewpoint. The long Confederate line around Petersburg and 25 miles away to their capital of Richmond was entrenched by the Union Army of the Potomac which included the Fifth. This is part of that siege. The march in the February 14 article published by the Free Press has now stopped. Along the way the Confederates fought and realigned their own positions. This documents the move and "racy" is a pun about their movement. March will also have articles even though winter rarely offers military action. The Siege of Petersburg continues on even as Wilmington, Charleston, and even Fort Sumpter are captured and both Richmond and Petersburg seem nearly taken on the birthday of the first president of the United States. Working for many years at the Mount Clemens Public Library, the loss of William Roberson came especially close. I wonder if Robertson Street was named for him. The newspapers often offered variations on a name and has occasionally made indexing or tagging difficult along with the changes in military rank. 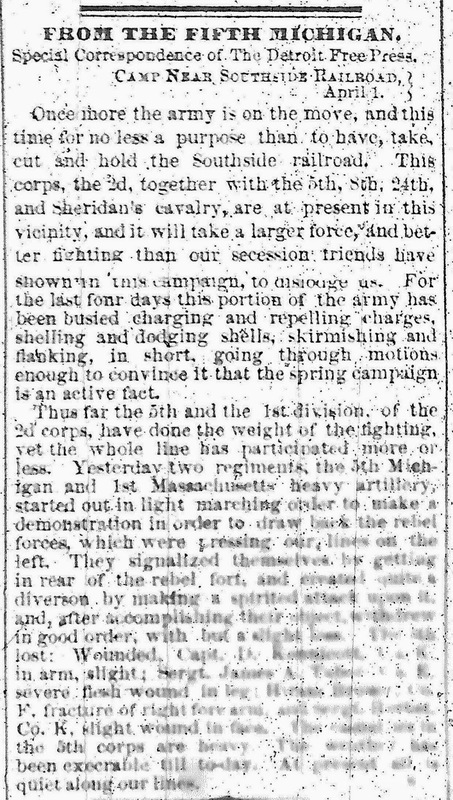 Only after General Lee surrenders will the Advertiser and Tribune have another article on the Fighting Fifth. General Meade's army as a whole earns the headline, but the Michigan Fifth in particular is featured on the front page of the Free Press even though the newspaper's opposition to the war gave them little coverage until the war's conclusion became more obvious. The men of the Fifth don't know it, but General Lee has ordered his own General Joseph E. Johnston to stop the Union's General Sherman and Grant from combining in the last major Confederate offensive. There will only be three days of fighting before Johnston pulls out and surrender by Lee draws ever nearer. Even this late in the war the regiment looks forward to improved rifles. 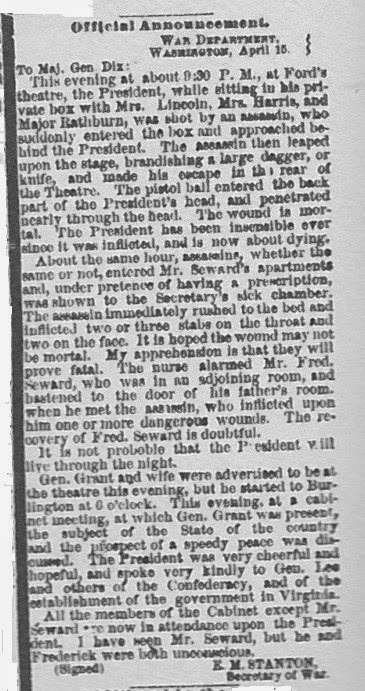 The "joys" of microfilm once again occur as the list of wounded at the end of this article is barely clear. The good news is that the Detroit Advertiser and Tribune seems to list the same wounded in their own article that is dated April 6. The bad news is that it was not published until their final article about the Fifth on April 21, so anyone unable to obtain the Free Press would have to wait until then to see it here. 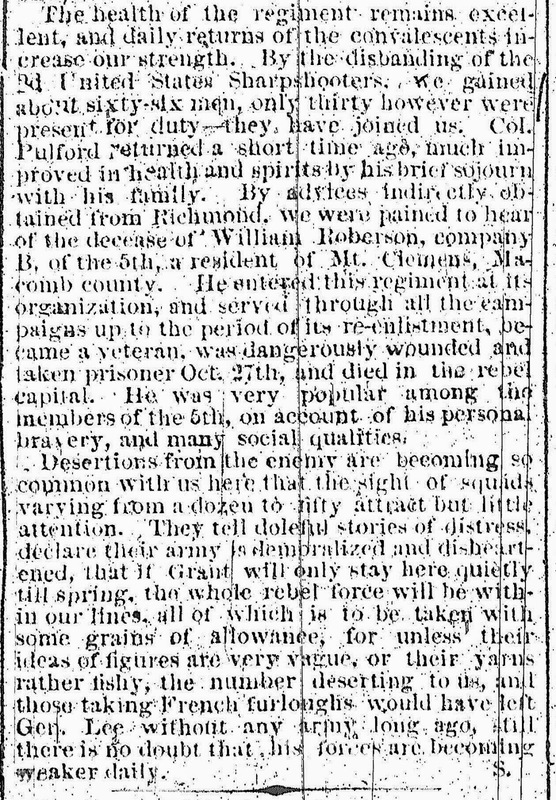 Returning to good news, but also delayed news, the Free Press has a two more articles about the Fifth this summer with one in June about Michigan deaths at Andersonville prison and a final article about mustering out in July. The news takes a national view next. 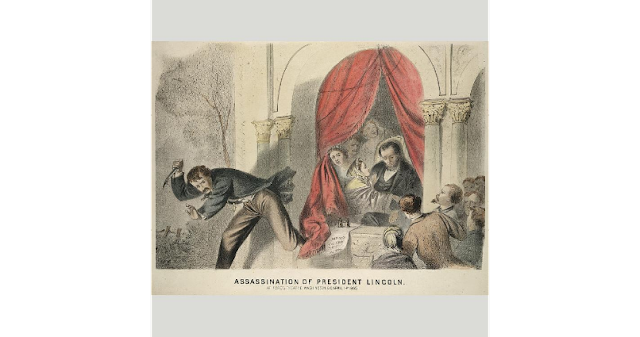 The 150th anniversary of the death of President Lincoln was April 15, 2015, but the actual shots were fired on the 14th. While this is not specifically news about the Fifth, it definitely affected the Fifth and all the nation. I've repeatedly mentioned how the Detroit Free Press was a "Copperhead" newspaper, in opposition to Lincoln and the war. I will feature here the front page of the Free Press for April 15. The news of the assassination came by telegraph. If anything shows the local reaction to the assassination, it does. Because there are several places on the front page where articles were posted it required more than one posting. 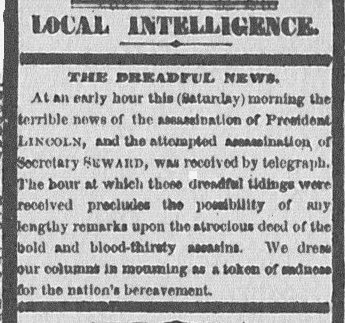 The front page for April 15, 1865 has a large headline section about the assassination of President Lincoln and other news that is in the middle of the large front page. It would have been the first thing noticed even though it's in the fourth column. The continuation of this column . . . the "Third Dispatch" and the rest of the article in the fifth column follows. After the main article, the other smaller items are posted on April 17. The rest of the front page was filled with local news and all of the articles mentioned from "The Retreat of Johnston" on. Above I only gave the front page headlines and the Western Union telegraph articles up to the Third Dispatch, this main article on the page in columns 4 and 5. The first three columns focused on local matters. Included among them, in the second column, is the popular section called "Local Intelligence." On the final, seventh column, is the official announcement by Secretary of War, Edwin Stanton. Other than the articles shown here, local news, a bit of European news, and other news about the war fill out the page. Here is the final article by the Detroit Advertiser and Tribune about the Fifth. After that the regiment's only coverage comes from the Detroit Free Press. 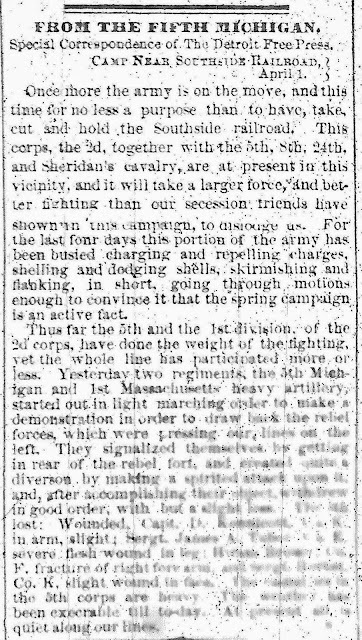 On the same page where Lincoln's unifying, conciliatory second inaugural address is again discussed and published in its entirety after earlier being imperfectly transmitted by telegraph, the final article about the Fifth appears now that the war is officially ended by Lee's surrender on April 9. The date of the article being sent, however, is April 6. Even in the final days, injuries and deaths occur. The names are a bit unclear, but seem to be Captain Kennicott of Company K, Sergeant James Taylor of Company F, Private Frederick Herbst, also of Company K, and Private Hiram Brown, whose company isn't noted. Later Brevet Major General Gershom Mott, who was one of the few Union officers commended at the Siege of Petersburg's Battle of the Crater, received a serious leg wound in the Battle of Amelia Springs. You might also want to read his report about the Siege of Petersburg. By now the Fighting Fifth is also known as the 5th Michigan Veterans Volunteers and they certainly were. 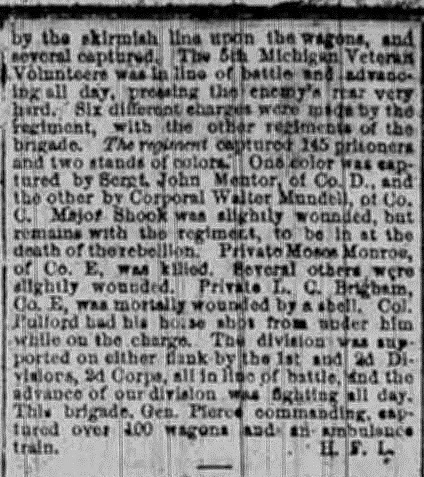 The article concluded with the special efforts of Sergeant John Mentor (also called Menter in an earlier publication) of Company D and Corporal Walter Mundell of Company C. Wounds included Major (earlier Captain) Shook and the deaths of two privates of Company E, Moses Monroe and L.C. Brigham. Even the much beloved Colonel Pulford lost his horse in the charge. Clearly the war was still being fought on the 6th even though it wasn't reported until the 21st. The Detroit news coverage from this point on is only handled by the Detroit Free Press, an ironic switch in coverage. 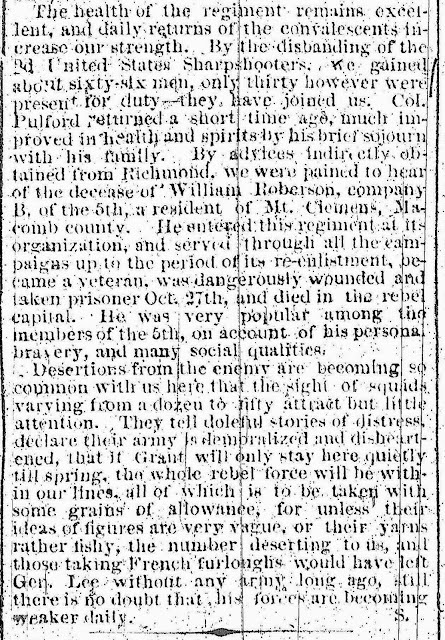 This article is about the Michigan soldiers of all regiments who died at Andersonville prison. The quality of this microfilm varies greatly and seems to be related to exposure. At the end of it all I give suggestions of ways to learn the names and regimental information. According to Michigan's Governor Aaron T. Bliss, who also had been a prisoner there, Michigan lost 700 men there. He gave that estimate in his 1904 speech at the dedication of monument to our dead there. The Dorence Atwater secret copy of the death register is online. 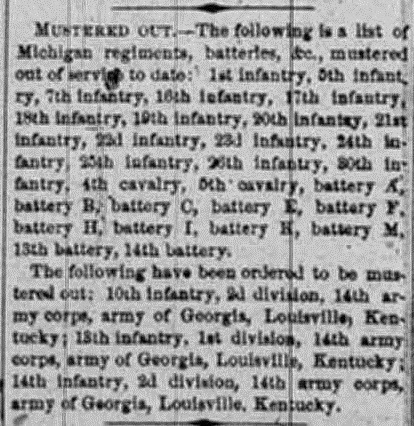 While imperfect "A list of the Union soldiers buried at Andersonville : copied from the official record in the surgeon's office at Andersonville" is worth scrolling to Michigan's losses through several pages. The National Park Service also offers resources to descendants seeking Andersonville Prisoner documentation. 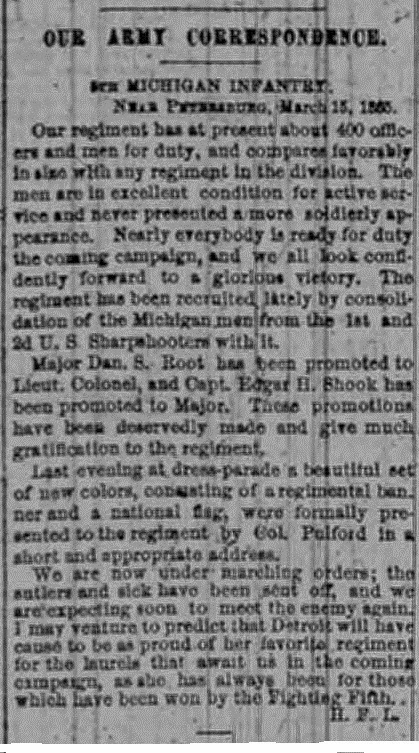 This final article gives the mustering out of the Fifth among other Michigan regiments. Alert . . . Heads Up! This was the final Detroit newspaper account posted. Please let me know if you have information from any other areas that have Michigan Fifth Infantry information. You may send your response to Lois Sprengnether Keel. As Blogger warns me, whenever you share an email address on the internet, nasty spammers see it, too. I get hundreds of spam messages daily because my storytelling information is all over the internet. To help me know your email is about this site, please put MI 5th Infantry in the subject line. As long as I have my regular blog staying active I can add to these pages on the Fifth Infantry, so I thank you for your interest. 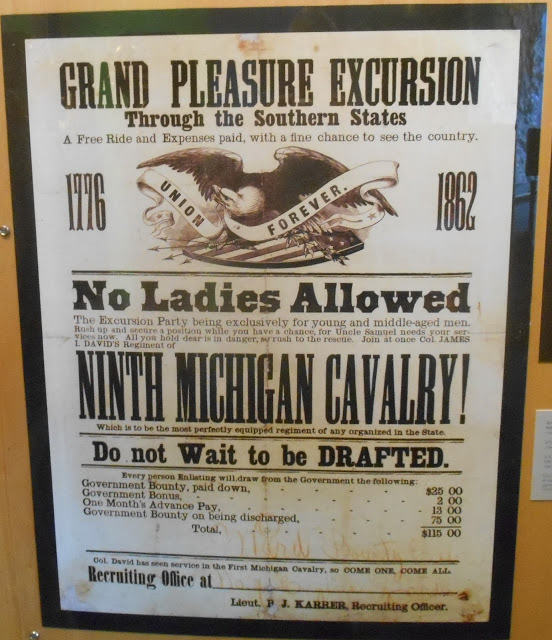 I've never found a recruiting poster or flier for the 5th, but loved this poster for the 9th Michigan Cavalry for its humor. It was part of a display at the Grand Rapids Public Museum. If any readers of this blog know of recruiting information for the 5th, please be sure to get in touch. I would also be interested in newspaper articles beyond those in the Detroit newspapers. They were used because the index by Helen H. Ellis for the Michigan Civil War Centennial Observance Commission made it possible. Even at that, she used the newspapers at the Burton Historical Collection, Detroit Public Library. The Library of Michigan's microfilmed newspapers and equipment made it possible to use a flash drive to bring articles back and put them in this blog. Because different editions were microfilmed, occasional glitches meant the articles Ellis found in Burton's newspapers didn't always appear in the Library of Michigan microfilms. Those dates however could give clues to finding articles in newspapers where other areas had many members join the 5th.